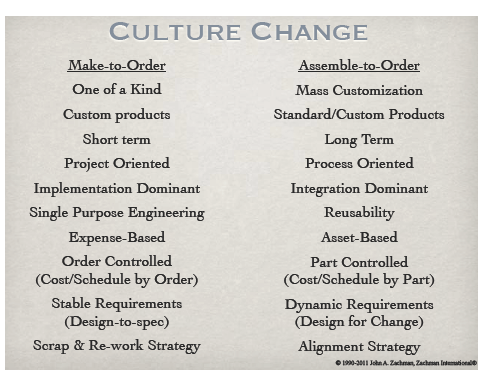 There is a huge body of knowledge around Culture Change. It takes time and perseverance and someone has to start working on it long before the Enterprise gets into extremis. However, in terms of Enterprise Architecture, the good news is, you only need a few “Early Adopters” that can begin working in the “new paradigm” and orchestrate the Culture Change only as fast as the Enterprise can assimilate it... hopefully in time to stay in business. I worked for IBM for 26 years. I retired in 1990. Before I tell you this IBM story, I want to say, IBM was a very good place to work. They never asked me to do anything illegal or immoral and they get a couple of gold stars for that! But, IBM was a Job Shop (make-to-order) for 80 years! They made custom computers. They didn’t start manufacturing the computers until they got the orders. The customer sat down with his or her friendly IBM salesman and filled out the Data Processing Order Worksheet... the DPOW... in which the customer specified the computer in excruciating level of detail. How may words do you want? How many characters in the Words? Do you want octal, decimal, binary... fixed decimal, floating point... etc. The salesman took the DPOW back to the Branch Office and keyed it into the Advanced Administrative System (AAS), the biggest on-line system the world had ever seen at the time. It drove the entire IBM Corporation... production planning, material acquisition, personnel... whatever. We were really proud of this... we built custom computers! We would give you a tour through the Manufacturing plants in Endicott, Poughkeepsie, and your company name would be hanging over the machine as we were custom building it for you. Look! There’s YOUR computer!! We are custom building this machine, just for you! ...And we will have this System 360, Model 30 for you in just two years!! The customers started saying, “Two Years!!! I want immediate delivery, low per unit product cost, high reliability, low maintenance cost and I am willing to take a standard computer off the shelf!” So, IBM began to change the strategy from Make-to-Order to Provide-from-Stock. By the time I retired, they had been working on this for about 20 years and hadn’t quite made it yet! As I remember, I think there were still some issues surrounding managing local inventories. John Akers was the CEO when I retired and in my opinion, one of the best CEO’s IBM had. But he was “holding the bag” when the thing cratered. When I retired, there were 450,000 employees. Within 2 years it was 200,000. But, John Akers’ stated strategy was “custom computers, mass-produced in quantities of one for immediate delivery.” It took another 20 years before that strategy was realized but IBM and Dell were notable for assembling in the channel. You are going to change what all the employees think is right and wrong, up and down, black and white, good and bad, not to mention the union rules, the manufacturing plants, machine tools, materials and suppliers! You are changing the Business Processes, how they behave, the tools and technologies... you are going to take that thing and turn it upside down and shake it at the same time... and the problem is the people. What do you do about the people? Well... you could give them opportunities for early retirement! It may take you a couple of decades to make this happen! How important is this strategy spectrum issue? Let me answer that by developing a hypothetical scenario. Let’s assume that you are the CEO of the biggest and best automobile manufacturing and distribution company the world has ever seen. You are the big guy... and you’ve been the biggest and best for about a hundred years. And, one morning you wake up and discover someone else in your industry is delivering custom automobiles in five days at higher quality and lower cost than you can deliver standard automobiles off the shelf! Is this a problem? You’d better believe it is a problem! Let’s assume that you can figure out what they are doing... which may be a little difficult! Hey!! We are the big guy! We are the best! We’ve been doing this for about a hundred years and we really know how to do it! What are these people doing? Lets assume you can figure it out... Hey!! These people are managing parts not finished goods! They have changed their strategy from Provide-from-Stock to Assemble-to-Order! How long will it take you to change your biggest and best Automobile Manufacturing and Distribution company to an Assemble-to-Order strategy? Not a day! Not a year! Not a decade! You’d better hope you have enough assets that you can start selling off to generate sufficient revenue to cover the operating costs while you are changing the culture! Either that, or you can get a massive infusion of capital from an external source because you are too big to fail... the question is, did you use the massive infusion of capital to maintain operations while you are changing the strategy to assemble-to-order? ...or did you use it just to maintain operations? I would observe it is not adequate merely to produce smaller automobiles with different power plants... you have to change the strategy to an assemble-to-order strategy. Which alternative did you pick? I don’t know... we’ll probably find out in about 20 years. All it takes is one Enterprise in any one industry to figure this out and it will make life really interesting for all the other players in that industry! And, if one Enterprise in any one industry can figure out how to dynamically change their Enterprise to accommodate dramatic escalation of complexity and major reduction in time-to-market for change approximating zero, it will be REALLY interesting! !